As we begin Maple Watch, we hope you will enjoy linking up with other sugarmakers and students of maple sugar. This website is developing an inter-active map in which maple observers can directly post their observations. • Bruce Bascom and Family in Alstead, NH. • Marty and Anne Boisvert in Pittsfield, NH. • Martha and Rudy Carlson on Range View Farm, Sandwich, NH. • Brian and Sue Folsom in Chester, NH. • The Hunter Family in Tuftonbor o, NH. • Russell Lampron at Red Roof Maples in Loudon, NH. • Paul and Betty Messer in Orford, NH. • Hank Parker on Berry Farm, Campton, NH. • Mike, Richard and Elaine Moore’s Hank Peterson, Londonderry, NH. 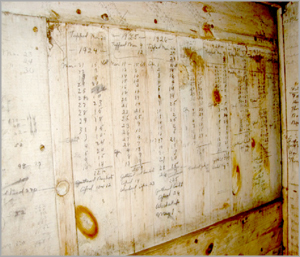 At the Hunter Farm in Tuftonboro, NH, old records of daily sap collections and daily production of maple syrup are recorded on the sap house door. There is a wonderful video about Hank on YouTube, Making Maple Syrup with Hank Peterson 2009 Londonderry, NH. New Hampshire sugar makers will hold a Maple Weekend, March 19 and 20. Sugar houses all over the state will be open for visitors. Find out more about Maple Weekend at nhmapleproducers.com, the web page for the New Hampshire Maple Producers Association. 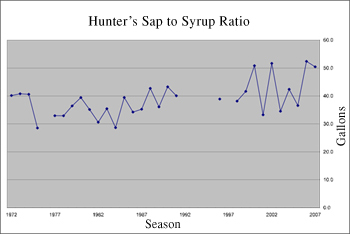 Hunter records show that it used to take 30 gallons of sap to make one gallon of syrup. In the last decade, sugarmakers have needed as much as 50 gallons of sap to make one gallon of syrup. Our first Maple Watch school link will take you to the Josiah Bartlett Elementary School in Bartlett, NH. Jon Marshall sugars with co-teacher Valerie Ford, 19 5th graders as well as students in 7th, 8th and 3rd grades. They have a sugarhouse right behind the school. Student videos, writings and other projects can be accessed via jbartlett.k12.nh.us. From the Home page, look for Classroom connections, then 5-6 Ford Marshall. That will take you to their tab for Maple Sugaring. If you would like more information about maple research at UNH or if you and your school or home school group would like to join Maple Watch, send us an email at forestwatch@unh.edu.